I don't really think there are many words I can add to this. Incredible mother. Incredible support. Fantastic birth and perfect babies. After experiencing a cascade of interventions during my son Ryder’s birth, almost 3 years ago, I was determined to get the joyful birth experience I so longed for, with my twins. 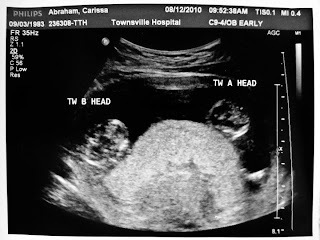 As soon as my partner Aaron and I discovered that we were expecting twins (oh my gosh, SHOCK! ), I immediately started planning the twins’ birth. I ordered Elizabeth Noble’s book Having Twins and More, where I learned that I was expecting monozygotic (identical) twins and started to understand everything about my twin babies and what choices I had in relation to their birth. And what little options I seemed to have in our city Townsville. Elizabeth Noble reassured me that my wishes for a natural twin birth were not unreasonable and I began to get excited, looking forward to everything that was yet to come. I soon met my doula Liz and after meeting her only once, I knew that I needed her at my birth and I asked her for her assistance. Liz said she would be happy to help me and I know I wouldn’t have had such a successful natural birth without her help. As I began to attend my public hospital’s appointments, I started to realise that it was going to be very difficult to achieve the natural birth I wanted in hospital. I received a lot of different info in relation to the Townsville Hospital’s ‘Twin Guidelines’ from the different registrars I saw throughout the pregnancy. 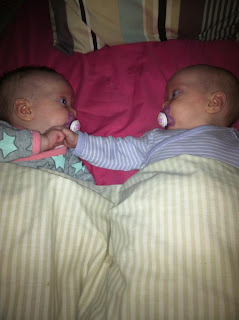 Towards the end of my pregnancy, I asked for a copy of the 'TTH Twin Guidelines' which were given to me and as I suspected, there were things that were conflicting with what I had been told by the registrars. I had been told by an obstetrician that it was necessary to ensure speedy delivery of the second twin following the birth of the first twin but the hospital guidelines state that as long as the second twin is doing well (good heart beat, good position), there is NO NEED to rush delivery of the second twin. What happens to the women who don't know to ask for a copy of the hospital's twin guidelines? I began doing extensive research on natural twin birth, I did lots of reading, I watched lots of twin births online and I made a very detailed birth plan (and an emergency c-section plan). I took the birth plan to one of my hospital appointments and the reaction I received from the Registrar was horrific. She was so negative and doubtful of my wishes and ‘warned’ me of the high risk of my babies dying without the ‘necessary’ hospital interventions. I had many registrars say the same things to me. I finally went to see a local midwife Penny, who worked at both the hospital and the community ‘Hut’ for midwifery appointments during pregnancy. Penny was the midwife I had been looking for, although she was unable to attend my birth and she suggested writing a letter to the Director of Obstetrics and Midwifery Operations Director at The Townsville Hospital, requesting the continuity of care from one midwife, that my babies and I deserved. I received a reply from the head of Obstetrics, agreeing to my request but explaining that the reason ‘high risk births’ are not offered continuity of care at the Townsville hospital was due to financial affordability – which I have since learned is rubbish! I also received a letter from the acting director of Midwifery, advising that she would be happy to meet with me to discuss my preferences and we organized a time to meet for the following week. Throughout this entire process, I actually felt very confident and relaxed about my preferences. Some may have seen it as fighting with the system, as it probably was but I was confident enough with my ability to birth the way I wanted that it didn’t feel like a fight at all. I kind of enjoyed the process, as I saw it as opening the hospital staff's eyes to the realization that twin births deserve to be treated the same as singleton births if all is well. At 37 weeks and 3 days, I enjoyed a beautiful Mother’s Blessing, put together by a lovely circle of friends. It was the perfect day and I left feeling very blessed and with a birthing necklace and birthing flags, created by friends and family. The following night around 8pm, I felt a little trickle of fluid down below. It wasn’t very significant so I didn’t think too much of it. But little bits of fluid continued to slowly trickle over the next 1-2 hours, until I called my doula Liz to ask if your waters could break slowly over time, which she said yes but to not worry and to just continue to monitor things for now. Shortly after I felt a pain in my lower stomach which felt like wind and I continued to have a few more of these over the next hour and I finally had to sit on the toilet, feeling like I may actually need to go to the toilet! When I realised it wasn't wind, I called Liz again (while still sitting on the toilet! ), to describe the pains I was getting as I was very unsure of it all. And while I was talking to Liz, the pains became quite frequent and regular and I said that I was now pretty sure they were contractions! Liz said that to keep monitoring things and that she would start getting ready. Around 12-1am, I called Liz to tell her that it seemed that my contractions were around a minute apart and that we would be going to hospital. Liz was going to meet us there. Aaron called my parents to come get Ryder, while I was having a quick shower and I told Aaron that when my parents arrived to pick up Ryder, I did NOT want to see my parents and to keep them away. I was not in a state to talk! So I hid in the bedroom when they arrived, while I continued to pack the hospital bag which we STILL hadn’t packed! Before we left for the hospital, Aaron asked me where the ‘name list’ was, as we still hadn’t decided on boys’ names! When we arrived at the hospital, I gave my birth plan and letter of informed consent to the midwife who was assigned to us for the first stage of my labour. She went over the notes and once again, warned me of all of the risks, bla bla bla…..luckily, I was focusing on breathing my way through the now very painful contractions, that her annoying words were not bothering me. I signed the letter of informed consent as per the painful midwife’s request and I went back to labouring. My birth plan was very detailed, including no continuous electronic foetal monitoring (much to the first midwife’s horror), intermittent monitoring via Doppler only, no vaginal examinations, no routine epidurals, no forceps, no directed pushing, delayed cord clamping, any baby examinations to be done either later or whilst baby is on my chest, among many others! This was mine and Aaron’s birth and we were in control, not the hospital staff. I spent the first stage of labour mostly in the warm bath with Aaron right next to me and Liz close by. I moved around and leaned over the edge of the tub, eyes closed, breathing my way through the excruciating pain. At one stage, I found myself thinking how good an epidural would be right now and I told Liz that I understand why so many women get epidurals and c-sections and that the contractions were terrible. Liz smiled and said that contractions were awesome. The thought of contractions being “awesome” put me back on a positive track and I went back to breathing my way through the pain. until I agreed to 10 minutes at the MOST of monitoring, as long as I could remain upright. I put the 2 belts on (one for each baby) and over time she returned and asked if I could keep it on longer than 10 minutes. I asked Aaron, who had been watching the monitor results, if the heart beats were fine and he told me with confidence that everything was fine and it was just that the stupid machine that had been skipping! I happily trusted Aaron and told the midwife that I was finished and was taking off the belt. Naturally she was not happy but what did I care?! Of course she wasn’t happy as she had no trust in a woman’s ability to labour without the electronics that she had been trained to rely on. Finally, the ‘painful midwife’ finished her shift and Helen Coxhead, the acting director of midwifery, who I had arranged to meet up with that morning, arrived at my birth and took over. Helen and another midwife continued to check the twins’ heartbeats with a Doppler while I laboured in different positions and respected my request for no VE’s. It was proving to be slightly difficult to find the heartbeats of both babies in different positions but Helen was a lot more experienced and trusting and persisted with the Doppler and a portable ultrasound. The babies were still anterior, heads down as they had been the entire pregnancy. Things continued progressing well and I remember realizing that I was in transition. I was on the floor on all fours with a sheet or towel draped over me, when my silence changed to moaning and I began shuddering involuntarily as I breathed through each contraction. I could not stop the gentle moaning and shuddering and I knew this meant that things were progressing quickly. Looking back, it actually felt amazing. I never experienced the feeling of transition with Ryder’s birth due to an epidural. Peyton remained with me until I knew I was ready to birth their shared placenta and she was then passed to Liz, our doula (I chose for the girls to go to Aaron & Liz, as I felt the need to be hands free to cope with the contractions). I had planned a natural third stage but I was starting get very faint as I was losing a lot of blood. I was feeling very sick and almost fainted each time I stood up. I quickly agreed to some syntocinon to get this placenta born! And shortly after, the twins’ 1.13kg placenta was born. The placenta was given to Liz who took it to be encapsulated. It was an amazing placenta, with sac still intact over one part and the membrane which divided the girls inside the sac. Some friends of mine had the pleasure of seeing the girls' placenta when Liz took it back to her house and my friend Natelle still refers to it as being an incredible placenta! After birthing the placenta, I felt better immediately, although because of the post-partum hemorrhage, I was cannulised to receive IV fluids for the next 24hrs. That didn’t bother me in the slightest. I had just birthed my twin GIRLS! And just the way I had wanted to. It was the most amazing experience of my life. I remember sobbing in happiness to Liz that I couldn’t believe that I “did it”. I remember Liz being a little bit teary in happiness too! It was such a magical experience. I was then ready to get both girls for their first breastfeed. Tyler was given to me first since she had waited the longest and I couldn’t help but guide her to the breast, as I felt dreadful that she had waited so long for a feed! Peyton soon joined us for her first feed and both girls were happily attached and breastfed wonderfully. And both girls are still eagerly breastfeeding around the clock, 10 months later. Not long after the girls had their first feed and cuddle, it was time for the twins' big 3 year old brother Ryder to come visit :) Grandma & Grandad brought Ryder up to the hospital, after his very first sleep over at Grandma's. Ryder was amazed and excited. It was joyous. Ryder loves his little sisters and they adore him! They think he's absolutely hilarious, as he regularly makes them laugh. Ryder does manage to sneak in a few shoves here and there but as with everything, I know this too shall pass! I am so grateful to have such an adorable little family, such sweet children. I feel absolutely blessed. Generally speaking, I had just had the most ordinary, NORMAL birth. So why has my story become such a big thing? Because many hospitals refuse treat multiple births as normal. Natural twin births ARE possible in a hospital environment with the right planning and the right support. It shouldn’t be a ‘fight for our rights’ with the system. NO woman should ever be told that they do not care about the welfare of their babies if they choose little or no interventions or if they choose to birth at home. Of course I cared about the welfare of my twins; this is WHY I wanted a natural birth. I was not ignoring hospital’s warnings that my babies could die, I just simply knew that their warnings were not justified. At a post birth appointment, a registrar told me that I put the hospital at risk. I knew this was not the case due to my letter of informed consent and it shouldn’t be my responsibility to care for the welfare of the hospital, as this was MY birth! I cannot believe what might have happened had I not voiced my preferences. I think I would have had a routine epidural after Tyler and then it would have all gone downhill from there. I did not have any unnecessary medical interventions (except the 10 minutes of monitoring when I took the belts off!). Thank goodness I was informed. Thank goodness that I prepared well. Thank goodness that I was so well prepared that there was no fear during my labour, I was not fearful at any point, which is why I think things went so well! I trusted my body, I trusted my babies and I trusted birth. All my love and thanks go to Aaron for being the rocking partner and dad that he is, to Liz for guiding me and supporting me throughout the pregnancy, birth and post birth (and for breastfeeding Peyton for me!) and to the midwives Penny and Helen for trusting a woman’s ability to birth naturally. If anybody would like a copy of my birth plan, letter of informed consent & my emergency c-section plan, please email me at carissa_aaron@yahoo.com.au. Thanks for sharing your story and for spreading the knowledge about natural births! Your babies and little boy are so cute. omg. what an amazing story! right on. it is sad that you had to fight so hard for that birth and that they tried to scare you like they did... but you did it! woohoo! Great birth story! I'm sorry you had to fight so hard for your natural twin birth...my experience with my twins was very different and it makes me so angry to see how they tried to scare you into handing over control of your body. How amazing! There is nothing better than following that motherly instinct. congratulations on your beautiful girls! What a great story! I am so glad that you did not let the doctors/hospital bully or scare you and got this awesome experience for you, your husband, and your babies! What a wonderful birth story, thank you for sharing. I agree with you that being prepared is the absolute key to birthing in a hospital environment. Your story is very inspiring and if I ever fall pregnant with twins I will certainly be coming to you for advice! Your family is so beautiful. By the way, I'm in Brisbane so it's nice to hear an Australian birth story and I can feel your pain regarding QLD public hosptals and the 'policies' that they have :S.
Such a beautiful story. Mama's....they're amazing, aren't they? This story is very similar to my own. I gave birth to fraternal twins 4 months ago out of hospital in my midwife's birthing suite. I absolutely loved the experience! I am so grateful to be reading and seeing more and more natural twin births! I am also grateful for those who fight the system to make it harder for anything less than these sweet natural births to take place! What an inspiring story. 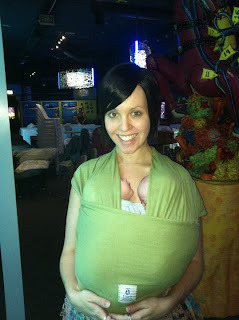 I am 35 weeks with identical boys and am planning a natural hospital birth as well. Thanks for the encouragement that I needed to hear during this time. This brought me to tears. We are only 14 weeks along and I had two beautiful natural births with my boys and want the same process with our twins. I'm so grateful this is possible. Thank you!! !